In an effort to offer relief to the victims of Hurricane Harvey, HSM Corporation has partnered with other local organizations and businesses to collect donations from their employees. 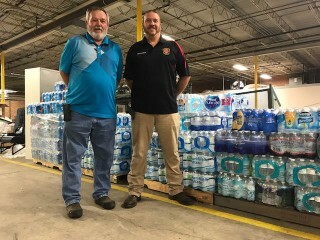 The effort is a joint partnership between civic organizations, such as community fire departments and local businesses, that have either already given supplies or have said they will collect and donate supplies in the next few days, Hickory Springs Manufacturing plant manager Michael Gouge said. With the goal of filling up two HSM trucks with supplies from Hickory, Gouge said he plans to form a convoy with a man from Morganton who also is sending trucks filled with supplies down to Texas. HSM is collecting non-perishable food items, water, blankets, sheets, sleeping bags and hygiene products that can be dropped off at their Highland Avenue plant. Gouge said he is making a “big push” in particular to get baby supplies like diapers, formula, bottles and toys. Working directly with the State of Texas Human Services, the Hickory organizers are still waiting for a specific address in Texas where they can drop off the supplies next week, Gouge said. HSM spokesman Bobby Bush credited Gouge for initiating the relief effort and emphasized that it has been made possible by many people and groups both within and outside of HSM.